Paleontologists can go to extreme lengths in their quest to find fossils and bring them back to the museum and the lab. Helicopters have been used to ferry researchers into remote uninhabited areas of the world and have lifted heavy plaster-wrapped dinosaur skeletons, the gypsum jackets keeping all the pieces intact and protected until the bones can be properly cleaned and reconstructed in the lab. Fossil hunters looking for tiny mammal jaws cemented by time and the elements into the pebbled pavement of the desert floor have crawled on hands and knees to scour the earth at nighttime, using ultraviolet flashlights to illuminate tooth enamel in the dark. They have holed up in tents for days at a time as desert storms sandblasted productive quarries another layer down, revealing swaths of fossil-rich rock that would have never been exposed with brooms, picks, or backhoes. And they have hired small armies for protection in strife-ridden, lawless, war-torn countries. Above: Walter Pickel recovers an arm bone (humerus) from the primates underwater cave excavation site. Diving caves may be less dangerous than dodging bullets, but it is far outside the air-breathing norms of topside paleontology. Learning from the successes of seaside underwater archaeologists and their own years of experience diving caves, Walter Pickel and Curt Bowen have opened a new window into the past for land-based paleontology. They have brought their technical diving skills to the search for fossil monkeys and other mammals in the Swiss cheese-like karst environment of the Dominican Republic. From the success of our first joint ventures into the field, it is clear that Curt and Walter are proving the promise of this new extreme approach to finding fossils: underwater paleontology. Our work is a collaboration with Dr. Renato Rímoli and the Museo del Hombre Dominicano in Santo Domingo, under the auspices of the countrys environmental ministry, SEMARENA. All of our finds belong to the permanent research and exhibition materials of the museum. Once we are done, they will become available to other research scientists. This usually takes a few years. Basically, it involves cataloging all the remains, preserving them, identifying them taxonomically, and then installing the fossils behind the scenes in the museums collections facility. Preservation is crucial, because the fossils we are pulling out of submerged caves pose unique problems. They are water-logged and must be carefully dried so they dont warp. Although the actual bones that we have found tend to be exceptionally well preserved and hardly broken, some are also paper thin, like parts of the shoulder blade and hip. Pieces easily snap off before the bones are dried and painted with a clear glue-like hardener. Once careful cleaning and preservation has been done, the real scientific and educational work can begin. Above: Underwater cave explorer Lindsey Pickel explorers one of the many underwater caves located in the Bayahibe area. Below: As the team moves inland from the shoreline, massive rock layers form towering ridges several hundred feet tall. These ancient limestone layers are prime locations for enormous cave formations. Containing millions of bats, our team stands in a massive pile of bat guano as we illuminate a large dry cave passage.  What mammals have been around and for how long?  How did they get there?  Where did they come from?  Did they evolve in novel ways because they have been confined to islands, which tend to have distinct ecosystems and produce some odd beasts from time to time through the evolutionary process?  Which animals managed to stick around until the earliest humans landed there?  Were any still alive when Europeans first arrived?  What caused their extinction?  How can we apply the lessons we learn to avoid further extinction on the island and elsewhere? A visitor to the Greater Antilles today would have no idea that Cuba, Jamaica, Hispaniola, and Puerto Rico were once home to an assortment of unique endemic mammals including primates, rodents, bats, shrews, and, most spectacularly, the giant ground sloths, some of which were the size of a Great Dane. The fauna of these islands is only a sampling of what existed on mainland South America, and is composed of animals that somehow came ashore, in some cases millions of years ago. All but a few small species, like rodents and the bats, finally died off, probably as humans began feeding off of them and began to spoil their natural habitats. Left: Cave Explorer Brett Hemphill crawls trough a small dry cave, traverses a shallow underwater sump and discovers a virgin cave passage filled with bands of cave bacon, crystal speleothems, and three foot long soda straws. Below: Underwater cave explorer Lindsey Pickel explorers another possible lead as the team searches for passages never before discovered. Of course, we dont expect to get complete answers to any of these questions quickly. So, as is the tradition in our field, we the finders, and our team of taxonomic experts, will get the first stab at it all. Once our initial analysis is well published, and we are satisfied the specimens and the research project has a strong, lasting foundation, well open it up. The material will become more or less public domain, but under the jurisdiction of the Museo del Hombre Dominicano. Other scientists will be able to study the fossils following a common set of access rules that are practiced by museums the world over. Our project began in 2009, after Walter Pickel and Lindsey Pickel, with Curt Bowen and Brett Hemphill nearby, discovered a monkey skull on one of their cave dives in a national park in the Dominican Republic. Walter and Lindsey deserve great credit not only for their keen eyes, but also for actually recognizing that the skull they found was a primate. They wisely left it in the water, in a protected spot, since international antiquities laws prohibit collecting scientifically valuable material without permission from local authorities. We learned of the discovery from Walters blog, and thus began a very happy partnership. We have been studying fossil and living monkeys from South America for years. On the mainland, of course, monkeys are still an important part of tropical forest habitats. But in the Caribbean they have long gone extinct, and now are only known from a handful of fossils from Cuba, Jamaica, Haiti, and the Dominican Republic. 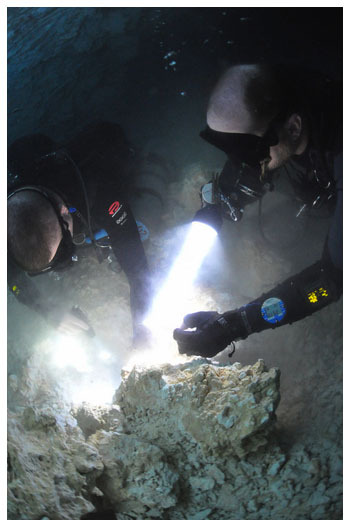 Below: Walter Pickel and Eric Deister help illuminate the cobalt blue waters and massive cavern zone of Chicho cave. Painting the cave with time-lapse photography, photographer Curt Bowen creates a unique light painting of beauty.
? Which lineage crops up is not really random since different groups tend to live in circumscribed places and times. 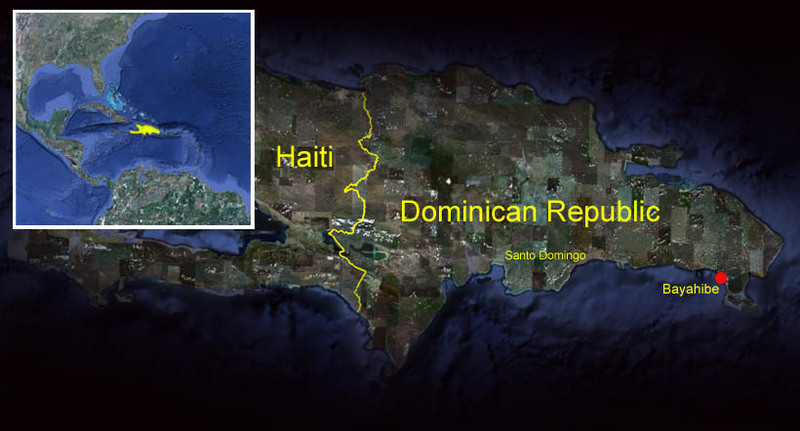 In the Greater Antilles, we would first expect them to have some connection with mainland South and/or Central American mammals, and then narrow the possibilities by assuming they would have some biological survival advantages that fit this unusual off-mainland situation. Perhaps they were competent swimmers when forced into the water. Or, they were small, able to eat almost anything, could hang out in a nest or tree hole while adrift and reproduce quickly and often after landing. Possibly they were able to hang onto a piece of living arboreal flotsam with enough insects or fruit on it to last several days on the high seas. Maybe some were even able to navigate most of the way through a mangrove swamp in which they lived naturally, if a few hundred years of low sea levels gave the vegetation a chance to narrow the water gap. Probably none would be large runners with heavy bodies, either long- or short-legged, like deer, pigs, and tapirs. Left: Bayahibe resident and part owner of Gri Gri Divers, Mark Boers poses beside fragile soda straw formations discovered in virgin passage. Below: Walter Pickel and Eric Deister spend hours carefully excavating the small primate remains from a pile of white limestone rubble over 700 feet from the cave entrance. Still, this leaves a lot to luck when paleontologists come looking. A fossil may be several hundreds, thousands, or millions of years old; but, no matter the location or time period, there is no telling in advance of the discovery where it would sit on its own evolutionary branch. Close to the base of the branch, where a lineage just started to evolve and it is hardly distinct anatomically from its close relatives? Or, long after that point, where it may look more modern and distinct in its appearance? And what if you find two or more species from that branch? Here its a bit like drawing from a deck of cards. If you pull something like a straight flush, on any one field trip or after assembling the haul over several expeditions, you would probably be able to fit the fossils into a natural sequence and get a good picture of how they evolved. If you pull four of a kind or a full house, you would be able to figure out how, say, the skulls of different evolutionary lines compared with one another. If you pull high cards, each belonging to a different suit and rank, you would know there are lots of things out there, getting a handle on biodiversity, but it would be difficult to see an evolutionary picture for any of the suits or lineages that you have found. Then, what type of body part would be the one coming to light? If you work on mammals, you are usually hoping for a molar tooth, because they come in so many different sizes and shapes that it is fairly straightforward figuring out the taxonomic group to which the animal belongs. Skulls, naturally, are prized, and limb bones are valued for what they can tell us about the overall size and shape of the body and about locomotion. Chance worked in our favor and we knew our luck was bound to be good for one powerful reason: so few fossils had been discovered before in Hispaniola. That meant the opportunity to find something important would be very high, just as long as we could find anything at all. Luck was also on our side, we quickly came to realize, because of the wildly unique context of discovery  an underwater cave, not a topside road cut or dry creek bed or cactus thicket. Why? Because, as we said, mammal paleontologists are normally delighted when they find just a tooth. Thats the expectation, to find the anatomical part that is made of the hardest natural substance the body produces, dentin and enamel, which endures far better than bones. They suffer less. Less trampling by animals, less being torn apart for food, dried and wet by the elements, baked and cracked by the heat, degraded by acids, crushed by the weight of sediment. All of that wasting tends to destroy the bodys bones, even the ones that hold the teeth in place, the upper and lower jaws, which wither away and leave only teeth behind. And when it is only the teeth that survive, we have no record of what the rest of the animal looked like. It can take years and decades, if ever, before we get to learn much about the body. So, back in August of 2009, we were quite ready to take the plunge after hearing Walter tell us where and how his fossil was found, and what it actually consisted of. In an underwater cave. A skull of bones and teeth. Long bones with full shafts. Little seemed broken, having been sequestered in a cave and immune to the typical processes of fossilization. Above & Right: Multiple long bones and a section of the primates skull are found lying on the limestone rubble. Carefully extracting the fragile bones, divers Eric Deister and Walter Pickel place the remains inside small Tupperware containers for transport out of the cave. Below: The team also discovered a multitude a other animal remains, such as bats, rodents, snakes, birds, and this Giant Ground Sloth jaw and skull. We notified our Dominican colleague Renato Rimoli, a zoologist who discovered the first Dominican fossil monkey some 30 years ago, and began to prepare to return to the site of the initial discovery. Three months later, we came armed with permits and an emergency grant from the research foundation of our university (City University of New York) that financed our trip, with Walter and Curt diving. It took them only 20 minutes in the water to find that our monkey was exactly where they left it, and bring it out. A few more hours of careful picking through rubble yielded more bones, a forearm, thigh, vertebrae, and even fragile ribs. The skull was in about 20 pieces, which were all glued together after a few hours of jigsaw puzzling in our Brooklyn College lab. Once done, we knew this was a major discovery. And the technical analysis began. We worked quickly to introduce the most complete skull, dentition, and partial skeleton of any monkey ever found in the Caribbean, into the scientific literature in the form of a brief report. Later will come a more exhaustive anatomical and evolutionary assessment. The whole process will take a few years to complete, since we will have to compare our specimen with many other New World monkey species, living and extinct, from the Caribbean and the mainland. Right: Walter and Lindsey Pickel pose beside a flowstone column discovered over a thousand feet back from the cave entrance. Below: Located only about 700 feet from the entrance to the cave in which the team discovered the primate remains, we located another small dry cave entrance leading to a small pool room. We identified the fossil as Antillothrix bernensis, based on its dentition. It is only the second specimen ever found of this species. Luckily, the first one had a few of its teeth intact  thats all it was, actually, three teeth  so we were able to match them up with ours. The name Antillothrix bernensis comes from Latin and Greek, like all taxonomic names, and does make sense in translation. Bernensis refers to a place, the cave site where the first specimen was discovered, Cueva de Berna, also in the Dominican Republic. Antillothrix is a compound term that fuses antillo, for Antilles, with thrix. Thrix, which means hair in Greek, is a term with historic significance. It was often added to a Latin or Greek root-word (like antillo) when scientists gave names to newly discovered species of New World monkeys. The tradition dates back hundreds of years. It may have begun when a small marmoset monkey was named Callithrix, which simply means pretty hair. Now we often use it when forming names to signify that the primate is a New World (not an Old World) monkey. Xenothrix, meaning strange New World monkey, is another example. It is the fossil primate from Jamaica. All of this follows one of the oldest traditions in taxonomy, conjuring up Latin-like names whose meanings relate well to the particular animal (or plant) in question. On the practical side, it is a simple binary system that provides each species a unique identifier, so it minimizes confusion. Regarding the biological information we can glean from the fossil, first comes the forensics, then the adaptations. With a skull and long bones in hand, we estimate the monkey might have weighed roughly 2 lbs. It was a young adult, with teeth that did not have time to become very worn from feeding, which normally happens in wild mammals  and even in humans. Its last molar tooth might not even have been fully rooted in the jaw. It was probably a male, since the sockets for its canine teeth indicate massive roots, as would be expected if he had large, tusk-like canine teeth. The shapes of its teeth were not at all unusual, designed for eating squishy fruits and insects, meaning your average New World monkey diet. Its lower limbs, however, were more heavily built than in other New World monkeys, with a relatively short thigh. So, it must have moved differently from most living mainland forms. We cannot yet tell whether it was totally a tree dweller, as all of the living New World monkeys are, or if it also used the ground for feeding. Right: The white enamel teeth of the primates upper jaw and nose section sit perched upon a rock outcrop. The other big question is: What, if any, other fossils are like it, and what does that tell us about when this line of monkeys arrived in the Caribbean? There is no one particular fossil that Antillothrix closely resembles, but when we lump it with the fossils from Jamaica and Cuba an interesting pattern emerges. Although the actual ages of all these extinct species may be rather young, perhaps several thousands of years old (one Cuban ankle bone may be millions of years old, however), they reveal a mixture of primitive and non-primitive features. By primitive we mean characteristics that we also see in really ancient fossils. Antillothrix, for example, has some features that look like a 16.4 million year old monkey fossil from Argentina. There is also a large series of fossils from Colombia that are 11-13 million years old. It includes a few species that might be evolutionary cousins to the Greater Antillean primates. But our Cuban and Dominican fossils look more primitive than them as well. This tells us that primates probably arrived in the Caribbean long ago, more than 10 million years ago. There they remained, evolving. Some features evolved slowly or not at all, so they resemble the anatomy of truly ancient mainland primates. Other features changed a lot from the time of their mainland ancestors, so they evolved into different descendant species and genera. This, too, is quite the norm in paleontology. We find that animals evolve in a pattern we call mosaic evolution because their parts resemble the tessellated design of floor tiles, ancient and modern motifs arranged together to form a whole. 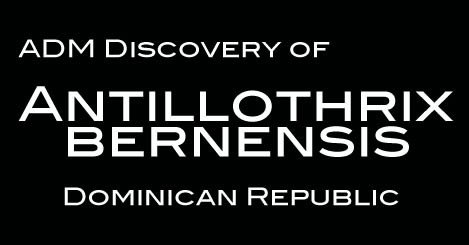 Our first article on this new find appeared in July, 2010, a day after we returned to the United States following our second foray into Dominican caves searching for fossils. This time we were helped out by a small grant from the Leakey Foundation, a California organization dedicated to supporting research on human origins, that is on humans and the non-human primates, i.e., monkeys, apes, and animals like lemurs and tarsiers. Caribbean monkeys are far off the track of human evolution, but we felt an appeal to the Leakey Foundation made sense. The Foundation often supports studies of primates to help build the evolutionary background for interpreting human origins. We guessed that the grants committee probably had never before seen anything like Curts video of Walter collecting a fossil primate underwater. After all, we hadnt either. They also knew our resumes as scientists were solid, and we were teamed up with professionals who were spectacularly good at finding fossil monkeys in an amazing new way. We were a good investment, and the cause of human evolutionary studies would likely benefit from the derivatives of the cause of the Caribbean primates. The second trip, in which Eric Diester joined us, broke new ground in several ways. The divers once again explored the monkey site, a raw tunnel system in a chaotic state of constant breakdown, brittle white limestone with long passages, shoulder-width constrictions, and galaxies of boulders and pebble strewn about. And the monkey site held more surprises. Moving aside some rocks uncovered more of the skeleton, and in the spaces between the rocks was even more. A cache of the tiniest, most fragile sorts of fossils mammal paleontologists ever find  wire-thin arm bones of bats, jaws of mice-sized rodents, and mandibles of a shrew-like mammal that fits rather well on the head of a pin. The original Pickel find was not a one-hit wonder. Actually, this was precisely what we expected. The underwater world would be a protective environment. Where one fossil survives, more  and more of the same individual!  would likely be found. But the actual yield far surpassed our wildest dreams. What have we learned thus far? One obvious lesson is that underwater paleontology is for real. The world is full of water-filled caves, and some will harbor fossil remains entirely new to science. The sink holes, chimney shafts, and surface cracks of karst environments are where the thin topside sediments flow during erosion, where surface water makes its way down, and where carcasses and skeletons will tend to drain. If bodies or body parts happen to get down there quickly after death, chances are high that breakage will be minimal. And, they will be superbly de-fleshed by microbial action in the water. In fact, the natural cleansing action of the water is such that one laboratory chemist asked us if the bones were cooked. Good question. So, Walter and Curt have helped us add another option to one of the major question of paleontological research: Where to look? Walter Pickel and Eric Deister busy sifting through the rubble, looking for toothpick -sizes bones. We have also learned something new about the primate fauna of Hispaniola. Thanks to the underwater excavation, we now know more than ever about what Antillothrix bernensis looked like and to whom it was related. Eventually, we should be able to develop strong hypotheses and an understanding of how it might have moved about its environment and what it fed upon. We also know some of the animals that were its contemporaries, and this gives us a window on the biodiversity of Hispaniola before the recent extinctions. But many questions will remain and these will only be answered by continuing paleontological work in the Dominican Republic and elsewhere. We need to understand much more about the ecological context of animals that lived in this region. How and when did they first arrive? How were they used as food sources (we assume) for the indigenous settlers? How long did they hang on before finally succumbing? Was their demise driven by environmental change? By ecological pressures created by humans, who not only hunt but also ravage forests for fuel and pasture land? Was the extinction rapid, or was it gradual? This last question certainly has very significant implications for the future of the remaining endemic animals of the Dominican Republic. Of all of the mammalian extinctions that have occurred worldwide during the last 500 hundred years, the vast majority have taken place on islands. Understanding this process will help conservation biologists form plans to preserve biodiversity, not only on Hispaniola but on other vulnerable islands as well. Above Illustration: Some of the main discovered primate bones from the excavation site. Finding the quality information we need is a slow process. We must continue to apply for grants, and we must continue to involve other experts in our research program including not only divers, but also scientists who specialize in rodents, bats, and shrews, geologists who can help us understand the processes associated with cave formation, and archaeologists who can interpret cultural remains from the Caribbean native people that we might find buried deep within a cave. Our experience over a short year has taught us that many secrets are waiting to be found as we peer into the underwater windows of submerged caves. They are an untapped resource with the potential to rewrite history in many parts of the world. The Caribbean is one of them. Above: Towering over 40 feet high and 60 feet wide, our team illuminates this dry cave passage for Curt Bowens camera. Below: ADM Exploration members stand outside a dry cave entrance for a team photograph. Left to right: Curt Bowen, Mark Boers, Eric Deister, Walter Pickel, and Uwe Rath. Team members not shown: Lindsey Pickel, Brett Hemphill, Siobhan Cooke and Alfred Rosenberger.